The Evolution Devotion: Time to short gold? Like most of you are yourselves, and like you'd probably have guessed about me, I'm generally in favor of metals. So if I say it's a time to short, then I do so begrudgingly, only because I genuinely believe it. If you have an emotional reaction to this, you better check yourself before you wreck yourself. Martin Armstrong is generally short through the rest of this year, into either 1st or second quarter next year. I think we can all admit, it's capable of going down when we fundamentally believe it should go up. So it's not an official sell until the CMO is down, but I was reviewing some old armstrong stuff, and he has 1275 as the cap of resistance going forward. We hit that recently and are fairly close to it now. Last time I bought GLD puts I doubled my money 2 days later. I'm tempted to buy Bo Polny's report, for some additional info, but it's 800 per month for turn dates. His stock report was only 200 for 6 months. I did buy that one, and I'm glad I did. 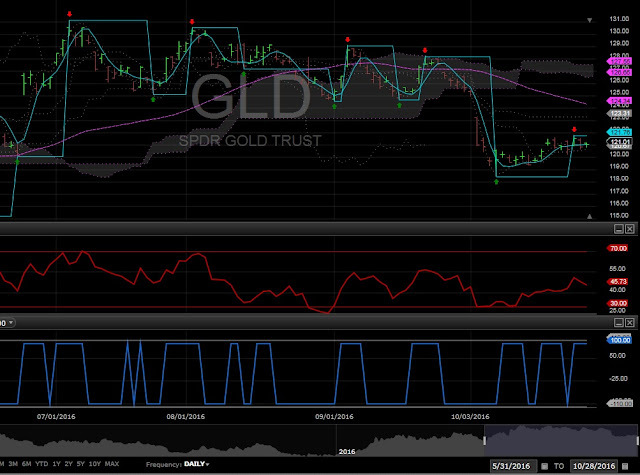 While expecting a stock crash the next few days, it's easy to see GLD just going the same way at first. I see this as a good opportunity for diversification. I'd hate to go all in on stocks and have it be wrong. I think a double bottom might be a good prediction. Maybe not quite to the same price, but to maybe the same 200 day moving average.